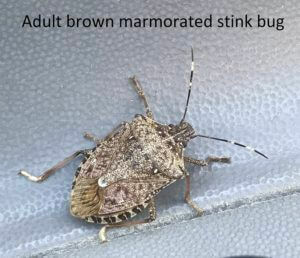 Stink bugs are a common pest in Tennessee. 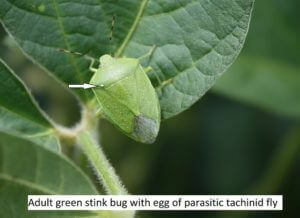 There are several species of stink bugs that may occur in soybean, and both the adults and nymphs cause injury by feeding on developing seed with their piercing-sucking mouthparts. 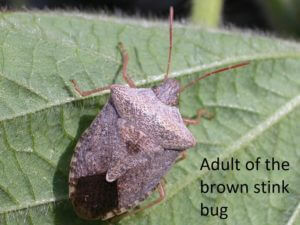 Adults are shield-shaped, either mostly green or brown in color, and 0.5 – 0.67 inches long. 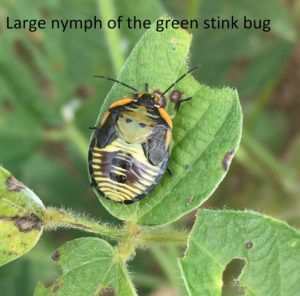 Immatures vary considerably in size and color, both within and among species. Stink bugs may introduce diseases into developing seeds, reduce seed size and germination, and lower milling quality. Damaged seed may appear wrinkled and smaller than normal. 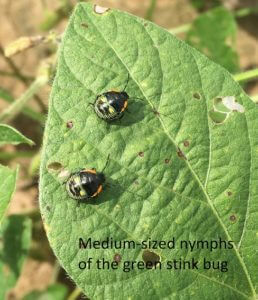 The green stink is the most common species that feeds on soybean in Tennessee. The brown stink bug is another common component of the stink bug complex. 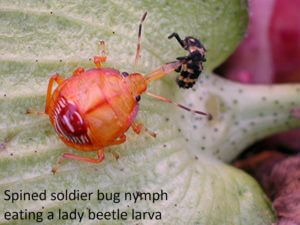 Other plant feeding species that may be present include the red-shouldered stink bug and the dusky brown stink bug. 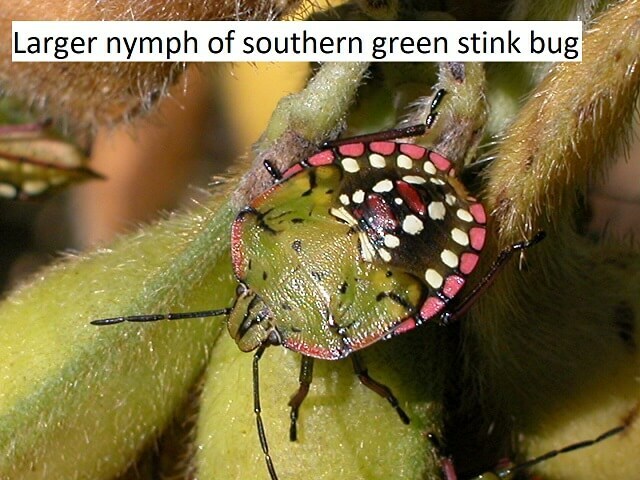 The southern green stink bug is less common but may be observed after warm winters, particularly in the southernmost counties. 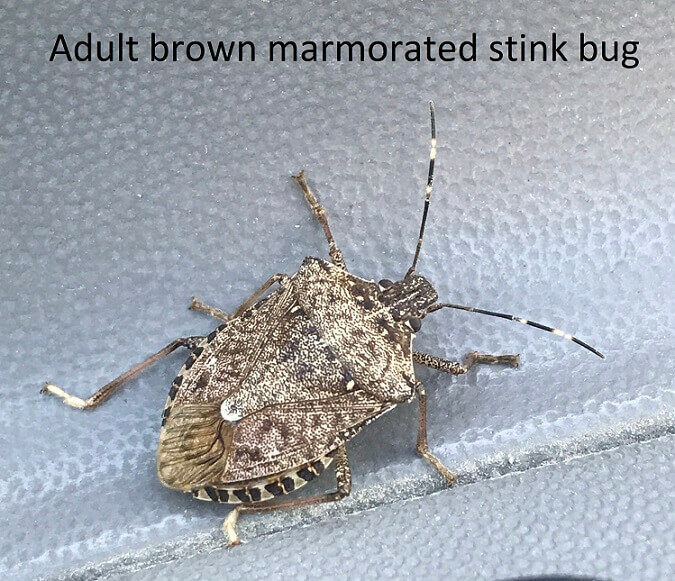 The brown marmorated stink bug and the redbanded stink bug are invasive species that may also be observed in some areas of the state. 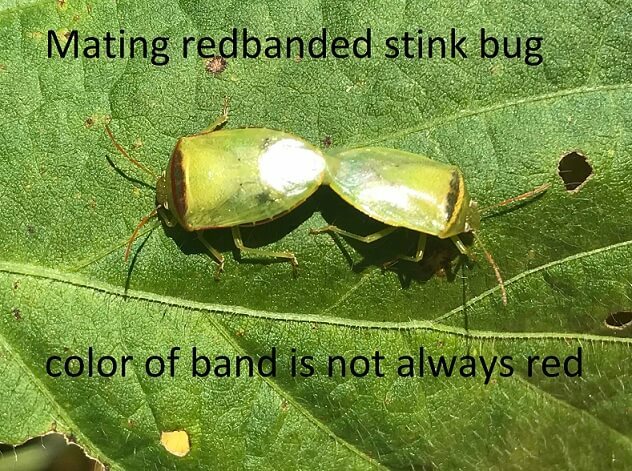 Like the southern green stink bug, redbanded stink bugs are more likely to occur after a very mild winter. 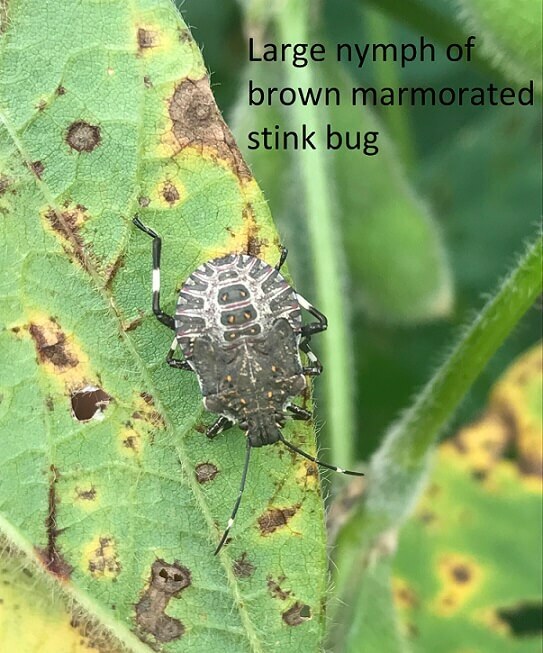 Finally, predatory (beneficial) stink bugs such as the spined soldier bug may also be found in soybean and are sometimes mistaken for brown or dusky brown stink bugs. 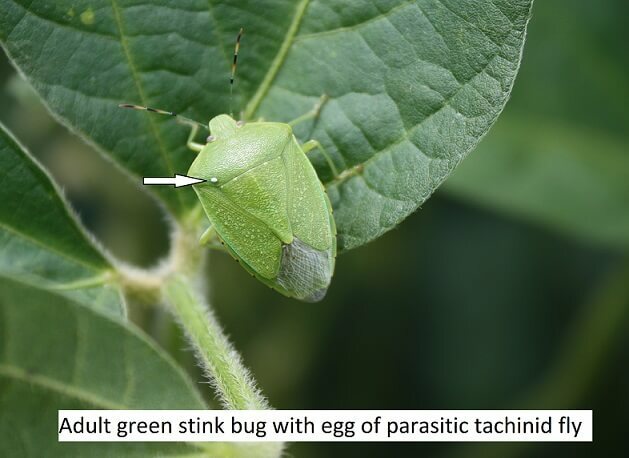 For more information visit the Soybean Insects Stink Bugs Fact Sheet (W200). 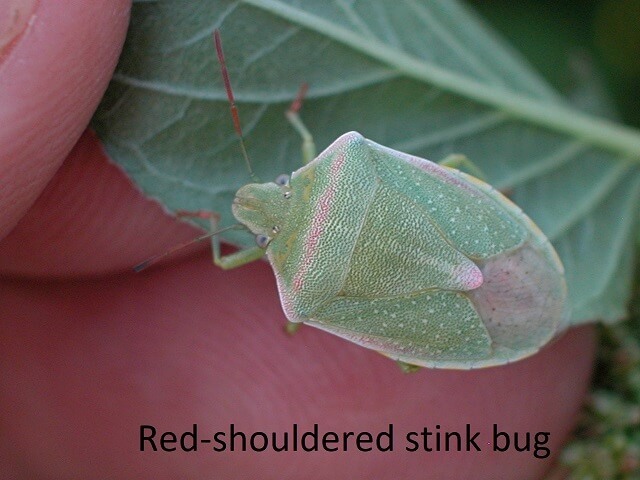 Because stink bugs are seed feeders, sampling should be concentrated when plants are filling seed (R3 – R6). 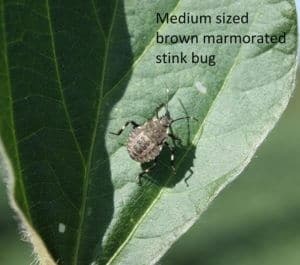 In an average sized field, take 25 sweeps with a sweep net and count the number of adult and immature stink bugs that are found at 4 locations. Increase the number of sampling sites in large fields (> 50 acres). 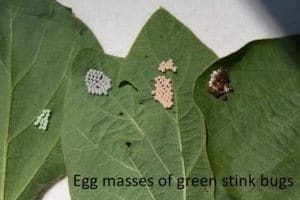 Stink bug eggs are characteristically laid in a mass of 20-100 barrel shaped eggs. Easily observing stink bug adults, immatures, and egg masses while walking through fields is a sign that thorough scouting is needed. 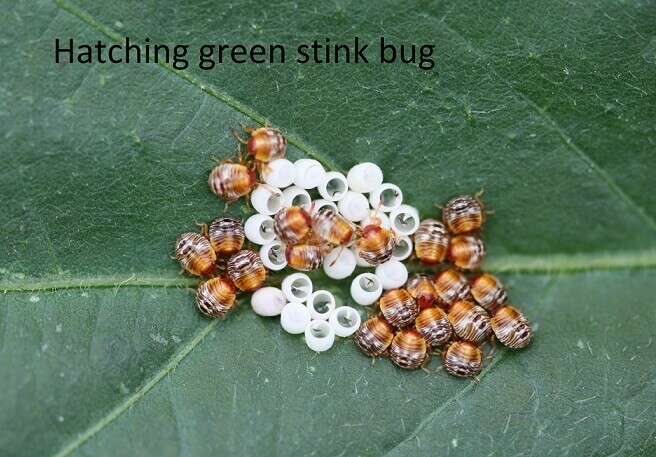 It can be important to correctly identify the kinds of stink bugs being found. 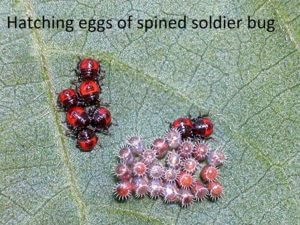 Some species are more difficult to control with insecticides. Do not count predatory stink bugs, and they may be common in fields infested with caterpillars. 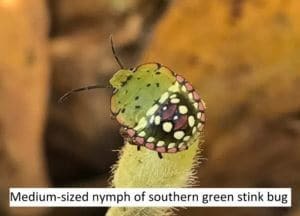 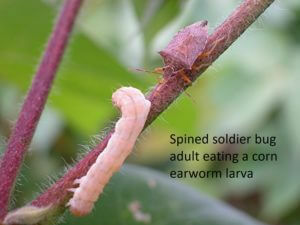 The spined soldier bug and other predatory stink bugs have a beak approximately twice as wide as the antennae (a sword); whereas, plant-feeding stink bugs have a beak about the same width as the antennae (a needle). 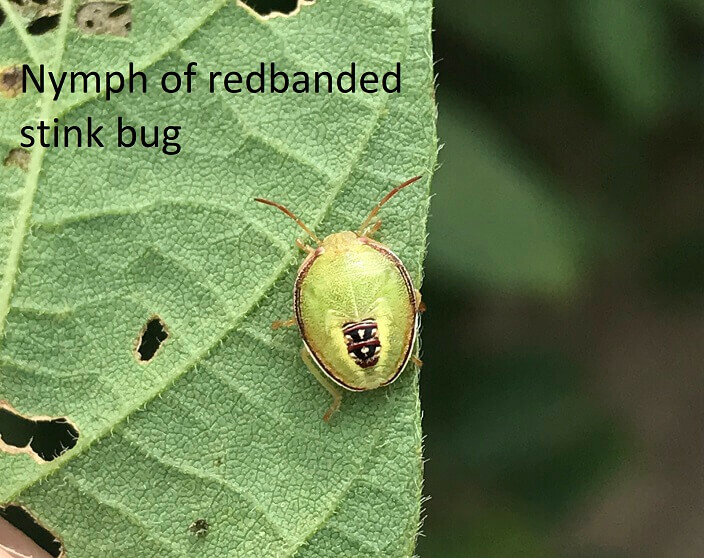 From beginning bloom (R1) to full seed (R6), treat when an average of 9 or more stink bugs is found per 25 sweeps (or 1 stink bug is found per foot of row). For 7-10 days beginning at R6, treat when an average of 18 or more stink bugs is found per 25 sweeps. 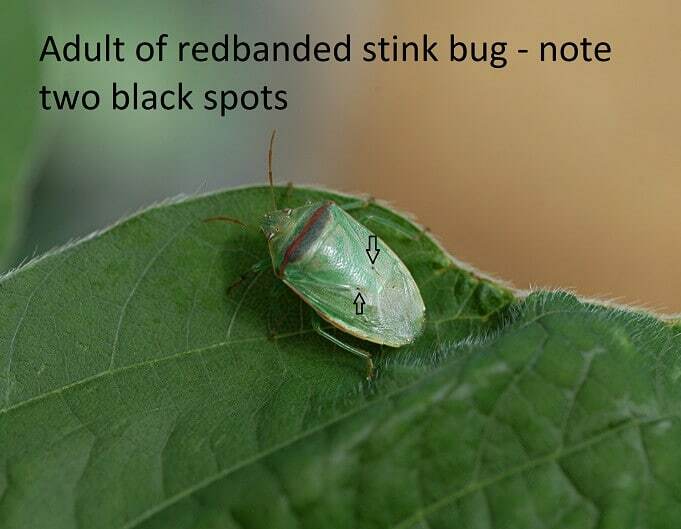 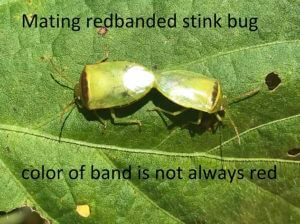 For redbanded stink bug, use a reduced treatment threshold of 4 stink bugs per 25 sweeps. 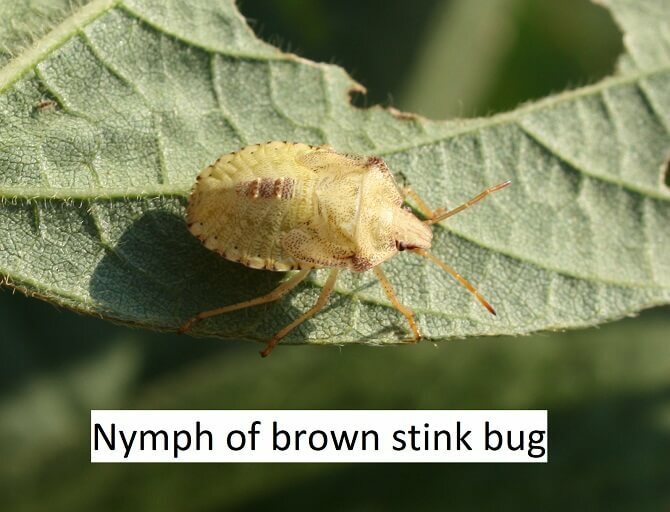 * Use acephate or relatively high rates of bifenthrin if brown stink bugs compose a significant percentage of the stink bug population. For redbanded stink bugs, use the maximum labeled rate of acephate, bifenthrin, or a tank mix of these two insecticides. For more information see http://utcrops.com/soybean/soybean_insects/SoybeanStinkBug.htm.